Late Victorian, early Art Nouveau French brooch enameled swan on diamond lake: Description by Adin Antique Jewelry. 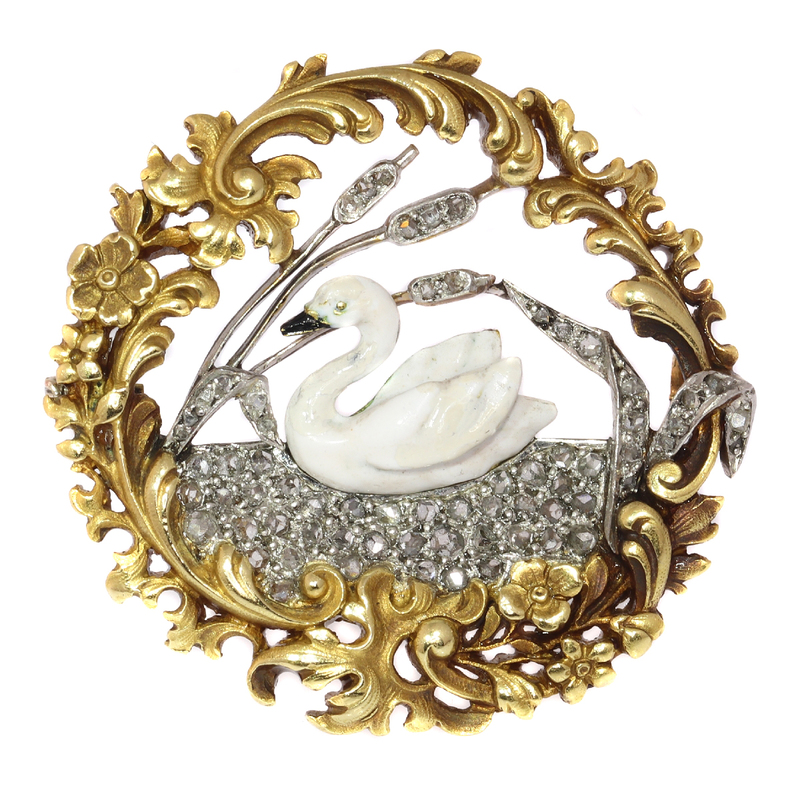 Envision this French Victorian 18K yellow gold brooch with a white enamelled balletic swan resting between the reedmace of a shimmering lake full of silver-encrusted rose cut diamonds as the miniature scenery through the hedge window of your garden. Emanating tranquility and peace, not one soul would ever feel like an ugly duckling wearing this intricate representation of applied art. Style: Between Victorian and Art Nouveau - Victorian decorative arts refers to the style of decorative arts during the Victorian era. The Victorian era is known for its eclectic revival and interpretation of historic styles and the introduction of cross-cultural influences from the middle east and Asia in furniture, fittings, and Interior decoration. Victorian design is widely viewed as having indulged in a regrettable excess of ornament. The Arts and Crafts movement, the aesthetic movement, Anglo-Japanese style, and Art Nouveau style have their beginnings in the late Victorian era. Art Nouveau (French for New Style) is an international movement and style of art, architecture and applied ar - especially the decorative arts - that peaked in popularity at the turn of the 20th century (1890–1905). The name "Art Nouveau" is French for "new art". It is also known as "Jugendstil", German for "youth style", named after the magazine Jugend, which promoted it, and in Italy, Stile Liberty from the department store in London, Liberty & Co., which popularised the style. A reaction to academic art of the 19th century, it is characterized by organic, especially floral and other plant-inspired motifs, as well as highly stylized, flowing curvilinear forms. Art Nouveau is an approach to design according to which artists should work on everything from architecture to furniture, making art part of everyday life. Style specifics: The Victorian period can roughly be divided into 3 distinct periods; the Romantic (1837 - 1860), Grand (1861 - 1885), and Late or Aesthetic Period (1880 - 1901). We consider this to be of the Late or Aesthetic Period. The jewelry of the late Victorian period once again returned to romanticism with more delicate and whimsical motifs such as stars, crescent moons, reptiles and insects. The discovery of the diamond mines in South Africa led to the use of mine, rose and cushion cut diamond stones. Many of the cultural aspects refer to the Mute Swan of Europe. Perhaps the best known story about a swan is The Ugly Duckling fable. Swans are often a symbol of love or fidelity because of their long-lasting monogamous relationships. See the famous swan-related operas Lohengrin and Parsifal. Theme (02): Reedmace (or Cattail) Flower Symbolism - The flower symbolism associated with the reedmace or cattail is peace and prosperity. Material: 18K yellow gold except for the face of the brooch that is set with the rose cut diamonds, that is in silver (see also the explanation on silver on gold). Technique: Enamelling is an old and widely-adopted technology. The ancient Egyptians applied enamels to pottery and stone objects. The ancient Greeks, Celts, Russians, and Chinese also used enameling processes on metal objects. Enamel is the colorful result of fusing powdered glass to a substrate by firing, usually between 750 and 850 degrees Celsius. The powder melts and flows and hardens to a smooth, durable vitreous coating on metal, glass or ceramic. According to some sources, the word enamel comes from the High German word smelzan (to smelt) via the Old French esmail. Used as a noun, "an enamel" is a usually small decorative object, coated with enamel coating, such as a champlevé or a cloisonné (different techniques). Diamonds: 66 rose cut diamonds. We do not have the weight of the diamonds which is normal in our trade when it comes to rose cuts. Hallmarks: The French control mark for 18K gold representing an eagle's head that was in use in France from about 1838.